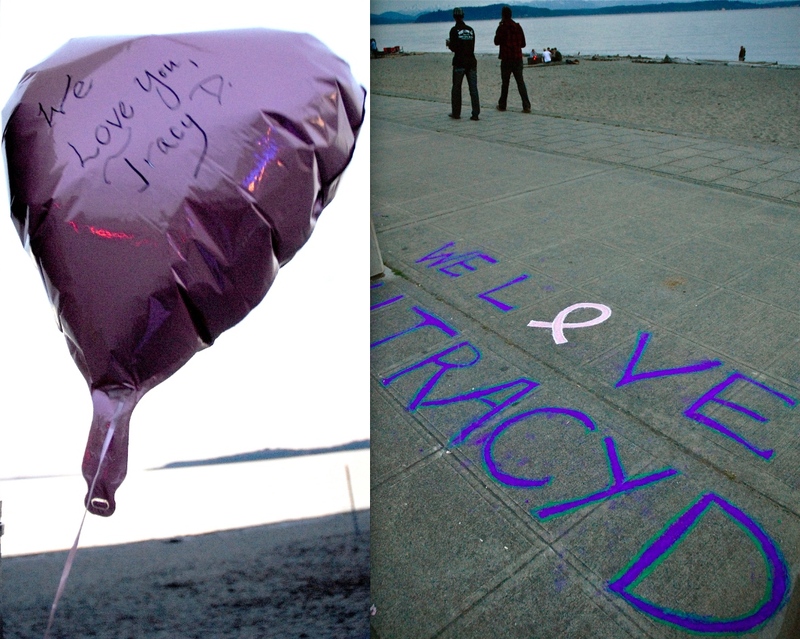 Messages of love and support are appearing around West Seattle for cancer survivor and activist Tracy Dart who is again facing some health challenges. According to three tipsters who have contacted the West Seattle Herald, people should be on the lookout for chalk signs and pink balloons around West Seattle that say "WE LOVE U TRACY D." with a breast cancer pink ribbon emblem. The photo above was taken on the Alki Beach sidewalk at 58th across the street from Dukes. As we understand it, these signs are well-wishes directed toward West Seattle breast cancer survivor and advocate Tracy Dart, who we featured in our May 12 story about the breast cancer fashion show benefit that featured Ms. Dart and other survivors on the runway. She has been a friend to the West Seattle Herald, has had some recent health challenges and we wish her well in her fight against breast cancer.